Skype-to-Skype and SkypeOut calls as well as Skype IM activity will not impact a customer’s voice plan minutes and data plan usage. It’s Verizon’s answer to AT&T’s forthcoming Skype for iPhone over 3G; however, given that planning and development activity have been ongoing for the past year, it’s a well thought out response with a focus on the user experience. The client will be a customized version of Skype Lite where the voice conversation is carried over the Verizon voice channel while presence indication, chat messages, mood messages and voice call signaling will be carried over the Verizon data channel. Launching a Skype voice call or chat session will be the same process as launching a traditional call. It’s integrated with the Address Book of the device such that all contacts can become Skype or SkypeOut contacts. Both the BlackBerry and Android smartphones can handle multi-tasking such that Skype “data” activity can continue to operate in the background while using other applications on the device. Client is optimized to take advantage of any battery life conservation features, certainly one of BlackBerry’s well known strengths. In response to one question at the press conference, Verizon stated they will not allow network quality to erode as a result of the additional load created by this service. SkypeOut becomes the de facto replacement for all Verizon’s other consumer international calling activity, especially for calls to those 44 countries on Skype’s Unlimited World Calling plans. Provides a subtle but significant carrier endorsement of BlackBerry and Android devices. the underlying architecture takes advantage of the existing robust and scalable voice architecture while exchanging data over a wireless data service that is widely perceived as the best in the U.S due to the combination of its reliability and coverage. requires the installation of “Skype gateway” servers within Verizon’s infrastructure to terminate Skype calls under Verizon’s management and control, offset by the fact that there are no termination charges for Skype-to-Skype calls. calls cannot be made from locations without carrier network coverage (to a large extent Verizon’s U.S. geographical coverage addresses this issue but one can also be deep in a building with WiFi but no carrier). Will Skype Instant Messaging become a replacement for SMS messaging and cannibalize SMS revenues? Skype IM messages simply go out over the data channel as one application for the data plan. What happens when a Verizon customer is roaming in other countries? Can visitors to Canada or Europe continue to use Skype at no additional cost while in Canada? or will a roaming charge apply? Verizon is currently offering these devices with a “Buy One Now, Get One Free” feature and a two year contract at prices ranging from $29.99 (Storm 1, 8530 Curve)to $179.99 (Storm 2). Will the lack of a low cost phone, such as 3’s Skypephone2, with Pay-As-You-Go impact adoption? What is the level of carrier exclusivity in the deal? Will we be seeing similar offers from T-Mobile US or AT&T any time soon? What portions of the embedded Skype software in the devices are exclusive to Verizon? the Bell Canada/Telus networks can not only support EVDO (same BlackBerries as offered by Verizon) but also GSM/LTE supported devices with their new HSPA+ network launched in time for the Vancouver 2010 Winter Olympics. all three carriers now offer the iPhone; in this case Rogers was the original carrier with it. What level of support will Verizon provide for BlackBerry’s app store and Android’s market? Will Verizon facilitate and promote them or even provide an aggregated app store? Final question: Skype stealthed its way onto AT&T 3G through the combination of supporting calling over WiFi access points (worldwide) and FCC lobbying; Skype is certainly helping to drive iPhone sales at AT&T. Can the combination of carrier-supported “free international calling”, full multi-tasking, a more robust and reliable network and the currently top selling smartphone brand in the U.S. sustain and build Verizon’s user base? Bottom line: carriers are recognizing that Skype needs to incorporated into their infrastructure as a key element providing both uninhibited access and the network resources to ensure a high quality, positive user conversation experience. Most importantly they are discovering that Skype can become a marketing tool that drives market differentiation and user adoption. 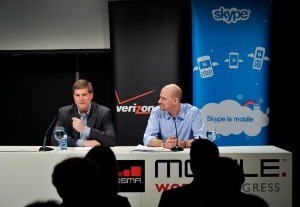 For further commentary Carl Ford and I recorded a podcast conversation yesterday: Jim Courtney & Carl Ford Converse about Skype & VZW.